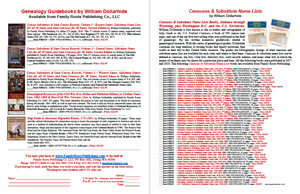 Genealogical Resources of the Civil War Era: Online and published Military or Civilian Name Lists, 1861-1869 & Post-Civil War Veterans Lists, 2nd Edition. Censuses & Substitute Name Lists: 52 books: Alabama-Wyoming + DC + U.S. Territories.